As you can guess from the title this is a giveaway. I am a fan of Dr Organic and they have launched some new products. 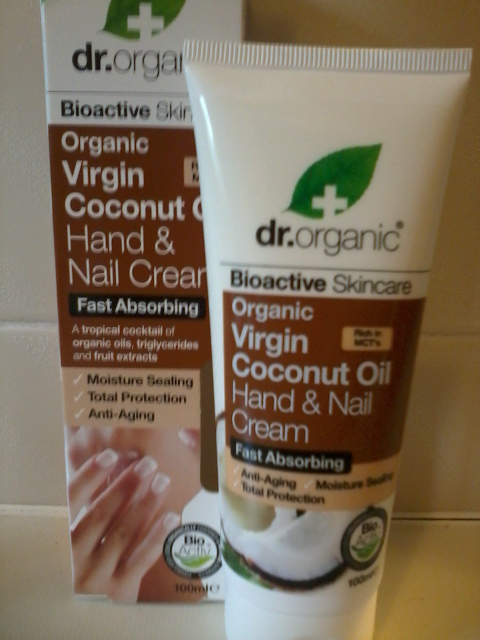 I am offering you the chance to win the new Organic Virgin Coconut Oil Hand & Nail Cream. Now I must confess I brought this for myself only to come home and find it contain one of my allergens. Sometimes even I forget to read labels properly. The active ingredients in this product are Coconut, Aloe Vera, Cocoa Butter, Papaya, Mango, Mangosteen Fruit, Fig, Orange, Lemon peel, Lime oil, Vanilla, Vitamin E & C. This is suitable for vegetarians and vegans plus free from parabens, sls, artificial colours, fragrances and harsh preservatives. Dr Organic is against animal testing. I am using Rafflecopter to manage entries. I have made one question mandatory in an effort to weed out time wasters. If you fail to follow this instruction you will be disqualified. Following me on social networks is not required but will gain you extra points. Giveaway closes on 24th August 2012 and is open internationally. Dr Organic is free from parabens! Sorry to hear you're unable to use this product, it looks lovely!